Dreamed of building a boat yourself but aren’t sure you know enough to get started? Join us for one of our two-week dory courses. Working with our master builder, you and your classmates will construct a traditional Banks dory, beginning with raw lumber and culminating in a launch party and celebratory row. Check our news section for upcoming courses. While we definitely have a soft spot for dories, we also build a variety of other classic wooden boats, including sailing dinghies, power skiffs and handsome rowing tenders like this one made for the Schooner Martha Seabury. To see more small boat styles, check out Our Boats. It’s the defining feature of a Lunenburg-built Banks dory – the naturally-grown frames or what we dory builders call knees. Ours are cut from the lower trunk and roots of Hackmatack trees that are pulled from the muck of Nova Scotia swamps, then shaped to fit our boats, always following the grain for maximum strength. We build dories. Day in, day out, one after the other. 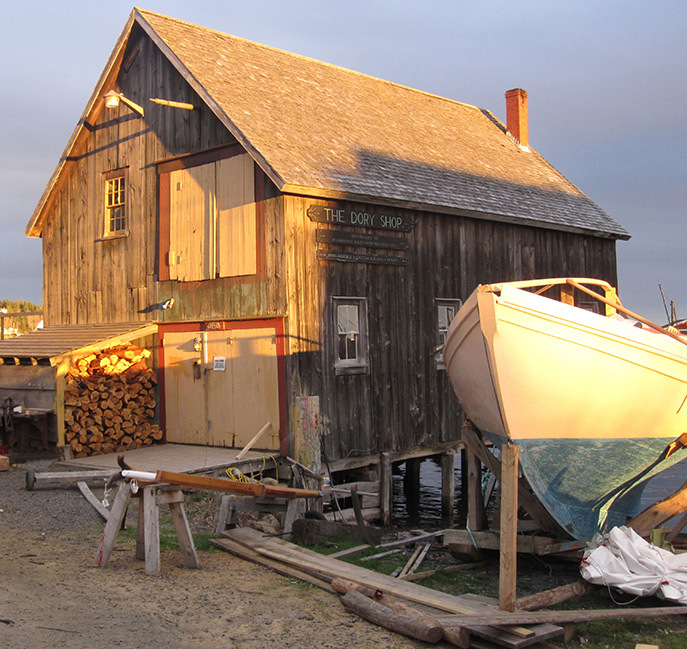 In fact, we have been building the iconic Grand Banks dory and other traditional wooden rowboats for close to a century. Although we’ve added a few power tools, we’re proud to say our boats are still hand-built using tried-and-true construction methods, along with quality materials like solid oak transoms, pine and cedar planking, and our signature grown hackmatack frames, all held together with quality copper fastenings. We like it this way. It works and it will continue to work as long as the sea is salty and the ocean has waves. That doesn’t mean nothing ever changes here. These days, in addition to dories for rowing and sailing, power skiffs and runabouts, we’re also building big powerful schooners, perfect for coastal cruising or blue water adventures across the world’s oceans. Like our dories, they are traditionally-built; in this case, from a designer’s half model instead of the decades-old jigs and patterns from which we build our smaller boats, their edges worn smooth from the touch of so many craftsmen’s hands. Our boats are strong, durable, seaworthy, and beautiful in their simplicity. But the place we work is special too. 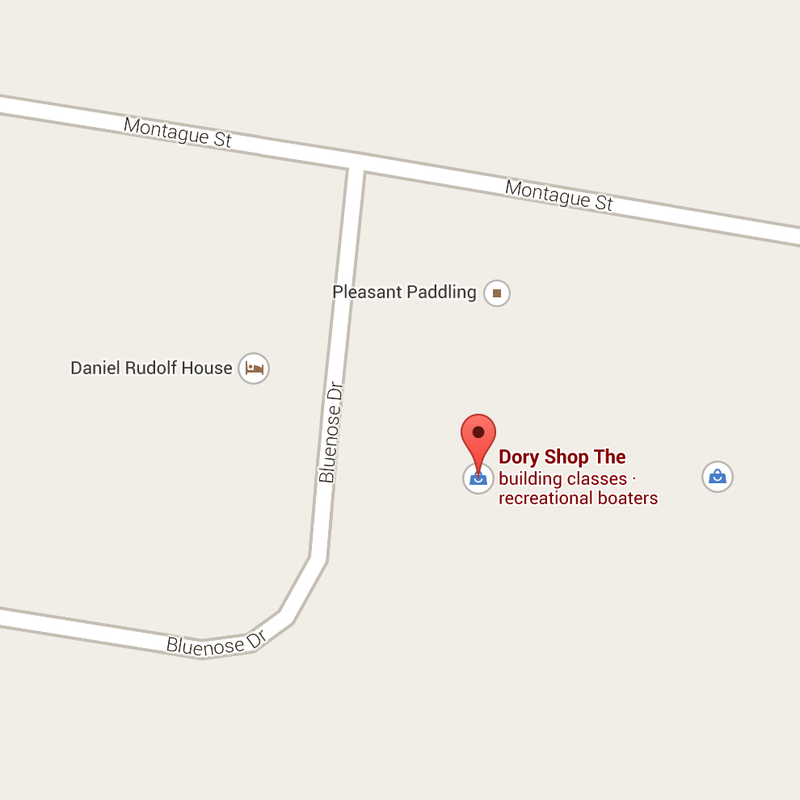 The Dory Shop is located on the harbour shore of Lunenburg, Nova Scotia, Canada, a port renowned for shipbuilding and a UNESCO World Heritage Site. We welcome you to drop by – the locals all do! – or better yet, to join us for one of our two-week dory building classes. For those unable to visit, we are happy to work with you to build the boat of your dreams and can assist you with all the shipping details.